Following a long year of waiting, the time has come to get your trainers on, don a pair of goggles and dare to enjoy one of the most entertaining and messy festivals celebrated in the Region of Valencia: La Tomatina in Bunyol! Get ready... The great battle arrives on 31th August. La Tomatina or the tomato festival is a Spanish festivity celebrated in the town of Bunyol, Region of Valencia at the end of August, typically the last Wednesday of the month. The origin of the tradition of La Tomatina dates back to August 1945. During the Giants and Big-Heads figures parade taking place at the town square several young people from the crowd wanted to take part in the parade, in spite of the objection displayed by the participants. This turn of events caused disorder, resulting in one of the participants getting knocked down, who in a fit of rage went to the nearest stall -which happened to be a market stall of fruit and vegetables- and grabbed some tomatoes… And thus chaos ensued, with the entire crowd throwing tomatoes at each other, until the local law enforcement intervened in this battle of vegetables and put an end to it. One year later, on the same day, the local young people tried to improvise a tomato throwing festival by starting a quarrel themselves, except this time they brought their own tomatoes from home. This went on for several years, gaining considerable popularity and becoming a tradition of sorts. However, during the 1950s, La Tomatina was temporarily banned, which of course didn’t stop the tomato festival from happening, resulting in many young people getting imprisoned. La Tomatina became an official festivity in 1957. In the present day, the Tomato festival is considered Festivity of International Tourist Interest due to its incredible success over the decades and its ever-growing popularity. A novelty introduced in recent years by city officials is an entry fee and a limited number of participants in order to ensure people’s safety. 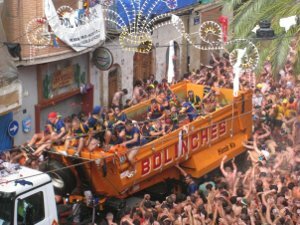 Leading up to the battle of La Tomatina a week-long celebration takes place with fireworks, parties, parades, and even a Paella contest the night before. The streets are filled with the smell of ripe, delicious tomatoes, unlike the ones used in the battle. On Wednesday at around 11 am the first loud bang will let the crowd know it’s time to start throwing tomatoes, and exactly one hour later a second bang will mark the end of the battle. After the battle of La Tomatina is over, it’s the firefighters’ turn to come in and clean up the streets completely splattered in tomatoes by hosing them down with water. For over six decades, the residents of Bunyol have managed to become the centre of attention through this curious celebration. Visitors flock here from all over the planet ready to release the stress and tension built up over the year by throwing tomatoes at one another. However, to make sure you have a fun day without incident, you should abide by a few basic rules, such as wearing appropriate footwear and clothes you aren't planning on wearing again, and protecting your eyes with swimming goggles.